After looking at it sitting on my shelf for almost two years it's finally time to delve into On The Road. There's something about Beat Generation literature that I find so fascinating. I don't necessarily love it and the writers are mostly pretty problematic figures, but their work made such an impact and I want to read it all to really understand why. Hmm I've not yet read anything Beat Generation. As I trust your taste in books, I will be checking back to see what you think about it! I know it probably sounds dull but I love this American series of non fiction books, Voice of Witness. It's usually interviews of people about a certain thing. The first one I read was called Patriot Acts, about the harassment people received after 9/11 because of their religion or colour of their skin. I'm currently reading their one about Palestine, called Palestine Speaks, it's really sad what these people go through. This book has been sitting on my bookshelf for the longest time, yet I still haven't read it! This reminder has made me bump it up the "to read" list a bit :) I'm currently reading Kazuo Ishiguro's latest book "The Buried Giant" and absolutely love it so far! I really need to get back into reading. I promised myself I would over the bank holiday weekend but I've been reaching for my computer in the evenings rather than for a book which is bad. I've downloaded a few to get started on, the first is The Grapes of Wrath. I hope that you enjoy On The Road. ooh i really want to read on the road, but haven't got around to it yet! maybe i'll save it for summer! i'm currently reading a compilation of f scott fitzgerald's short stories and really enjoying it! I've heard so many good things about this book! I'll get round to reading it one day. That is such a lovely edition! I have the "original scroll" edition of this book, and it scares me, since apparently Kerouac forgets to put punctuation or chapters or whatever when he writes under the influence (which I understand he did a lot for this book). 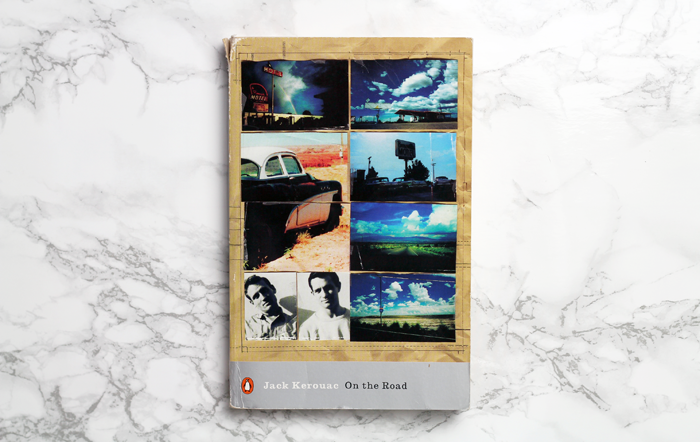 I've been thinking of rereading "On the Road" because I'm going on my own cross-country road trip this summer. I didn't like it when I read it in high school, but maybe I'll find it more relatable now that I'm older? Oh my goodness, this book is fantastic!! One of my all time favourites- I wrote my University dissertation on The Beat Generation and more specifically 'On the Road' so I hope that you enjoy it. Granted the style is a bit all over the place and there are still times when I read it for the 10th/ 11th time that I wish Kerouac would stop waffling but it is a product of its time and mirrors the improvised jazz that they were all into in the 50s. Similarly, I picked up The Executioner's Song by Norman Mailer as my first book by him in order to understand why he is such a revered writer without knowing really anything about him or the subject matter. Dave Eggars wrote the new forward to the book saying it is the "fastest 1,000 pages you will ever read" and that is so true. I can't recommend this book enough!